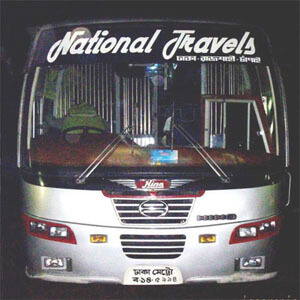 National Travels is one of the best transportation agency in Bangladesh to travel northern Bangladesh. It brings new luxury MAN coaches for a better and smooth ride”. MAN coaches’ chassis are designed and manufactured in Germany that offers less engine sound and 6 cylinders’ air suspension bags for a comfortable journey. For those of our customers who suffocated in AC, buses can now enjoy a smooth and comfortable ride through our new MAN coaches. National Travels started its journey in Transport business in the year of 2004 with only 4 luxury Hino coaches. Now they have 26 luxury buses to serve the passengers the best service. You can buy your necessary ticket from any counters of National travels. You can also book your seat over a phone call. The manager of the counter will provide your booked seat after your payment. You can check national travels bus ticket price and buy a ticket by visiting shohoz.com. Buying a ticket from online is very easy. It saves your valuable time and money. The international service is not available yet. If it is available, a notice will go to the press and social media. You can buy National Travels online bus ticket from shohoz.com. Sohoz.com offers TK 150 off for the online booking. You can visit the website and get TK 150 off. But the biggest offer is to use the app. You’ll get up to TK 300 by using the app. Just download the app and log in to book your ticket. National Travels can be the best choice for you to visit Rajshahi and other cities. You will get safety, comfortable and luxurious journey. They can ensure you an exciting journey. They try their best but though you think that there is a place to improve, feel free to call them. Your opinion will be honored and taken necessary initiatives.